Thanks for a great challenge last week, your Any Hero Christmas cards were great! We have winners to announce for our Inspired Stamps prizes! Congratulations Jean B. & Caro InLinkz picked you! The deadline to have Christmas cards to our shippers is October 31st so this week we challenge you to make Christmas cards for our heroes to send home to their family and friends! Can’t wait to see your card creations! Our sample card maker this week is me... My sample card maker couldn't make a card for us so at the last moment I added mine. I love your card. It looks so crisp. I like the wreath. Great card, Jan! 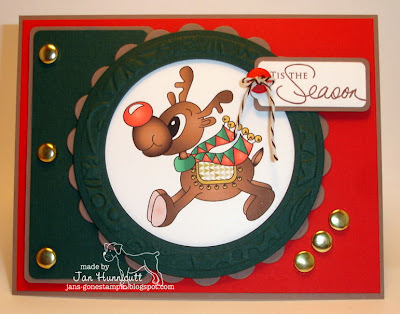 I love how you used a wreath as a frame for the reindeer - very clever! Thanks very much for the great sample, Jan. I really like the layout and the way you embellished your card. Jan, thanks for the reminder about the Christmas card deadline! That's one cute little Rudolph, and I love your "signature" tag/button/twine combo! I love the Reindeer. As usual your coloring & colors are wonderful. Thanks for sharing. What a cute reindeer! I love that tag with the button embellishment. Great sample Jan!